nesdev.com • View topic - How to program a NINTENDO POWER Cartridge ? How to program a NINTENDO POWER Cartridge ? Post subject: Re: How to program a NINTENDO POWER Cartridge ? infinest does it also work with SF Memory as basically its the same chip ? Nope the information written on the SF Memory is very different from the GB Memory from what I've seen in earlier posts. Somebody else would have to program another application for that. Hm, interesting. Ok then, can this GB Memory Cart hold GBA (advance) games ? Or only GB and GBC? Only GB(C) games. The GBA cartridge interface is completely different (voltage, data bus, cartridge shape, etc). Don't drink and drive, kids! Made a couple edits to the GB Memory News Ticker text. The Puyo Puyo/5in1 had a typo at the end of the 5th line and the 2in1 Harvest Moon text was incomplete. The Harvest Moon News Ticker text lists the top 5 rewrites for first half of 2000. Super Mario Brothers Deluxe, Legend of Zelda DX, Kirby's Dream Land 2, Kirby's Dream Land, and Metroid 2. I've dumped about 50 GB Memory carts with menus and the news ticker text is always one of the 5 variations posted. I can also confirm the news ticker text that was posted on the Japanese BB. I would be very happy to see some more clearer and simplified English instructions on this for regular us people.. I would also be interested to know if anyone has tried to populate the missing mx29f1601mc for these? what is the format of map file. Which being dumped along with ROM. How can I create my own? Colleagues, thanks to Infinest, I forked his GB Memory solution and adopted it for SF Memory. 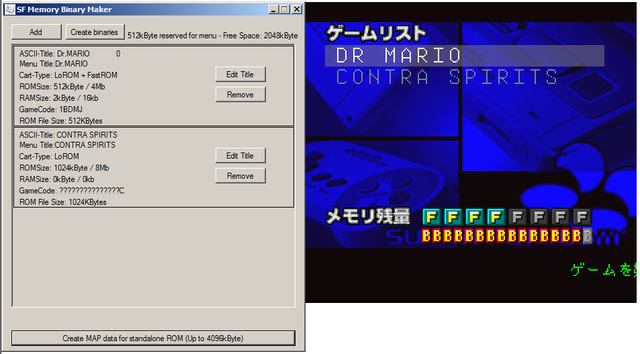 So now You can easily create ROM and map file for Your SF Memory cart. Obviously the code is a bit messy, so I will clean it up ASAP. Also bugs are expected, so I will try to fix them also. https://github.com/moldov/SF-Memory-Binary-Maker/ if You need binary it's on "Release" tab. Don't forget to put "Menu.sfc" 512Kb Menu file from NP cart in the same directory with program. Thank you guys for the amazing work everyone put in. I have been working on some Gameboy Nintendo Power cartridges and have been able to Read/Write the Flash and the Mapping and everything works perfectly. The only thing I would like to do is Read and Write the SRAM for saves. None of the code available for the GB NP cart seems to show how to manage the SRAM save data. I am looking to replace the aging batteries on some of the carts but don't want to lose all my save data. I have BennVenns Joey Joebags, GBxCart RW by Inside Gadgets and also the Sanni card reader. If there is any options or settings for either of these, please let me know. The only thing I would like to do is Read and Write the SRAM for saves. None of the code available for the GB NP cart seems to show how to manage the SRAM save data. If you are using the cartridge for a single game then you would access the SRAM like a regular cartridge, depending on the MBC. If you had it as a Multi-game cart, then you need to switch to each game like you were selecting it on the GB, probably wait a little bit, read the game header to check it's changed and read the SRAM like a regular cartridge once again. For game 2, it would be 0x82, etc.